Need a simple explanation of Business VoIP Phone Services? Check out our free guide. What Do Business VoIP Phone Services Do for You? Business VoIP typically refers to a VoIP-based phone system, or a phone system that delivers calls to employees over their office IP data network. Until about the 1980s, traditional phone calls were made via the Public Switched Telephone Network (PSTN) over copper wiring and switches. With the invention of VoIP, phone calls could be made over the same IP data networks that your computer (and now smartphone and tablets) leverages for web browsing, email, etc. Business VoIP phone services have been advancing for over a decade and typically do not require much in the way of hardware. With so many options on the market, executives and IT managers need to research before choosing the right phone solution for their business.Ensure the provider you choose has the features and reliability your organization needs to run smoothly. A business VoIP provider in today's world combines enterprise phone system features and productivity-boosting integrations with popular business applications. Below are just some examples. 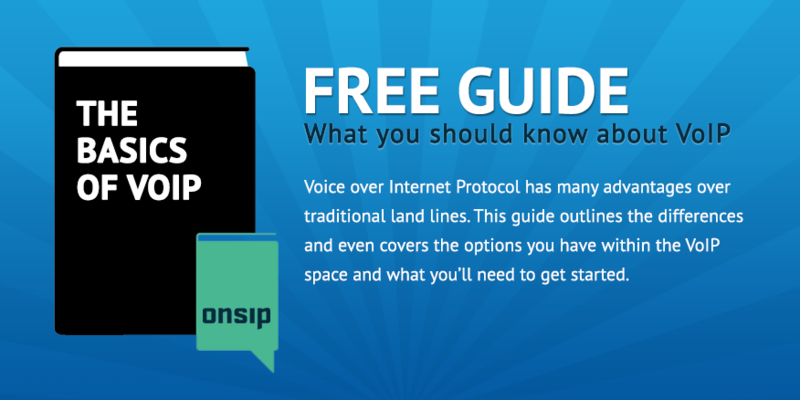 To learn more, download our VoIP Basics Guide (on this page). What Phones Do I Need for Business VoIP? Business VoIP phone services work with IP phones (that connect via ethernet rather than traditional phone cabling). There are hundreds of IP phones on the market, and OnSIP reviews VoIP phones so our customers can make informed decisions. The top tip we give in the realm of VoIP phones is to select phones that work with any business VoIP phone service. If a VoIP provider tells you that their service requires a certain kind of phone (and it can't be used with another provider), beware! That is a common lock-down tactic. OnSIP customers can use the OnSIP app, our free on-the-go business phone and voicemail management application. Available as a desktop app for Mac and Windows computers, as a mobile app for iOS and Android devices, and even as a browser app in Chrome, Firefox, and Opera web browsers, the OnSIP app lets you make HD voice and video calls, view real-time presence information for your contacts, and review past calls and messages. On OnSIP's Per Minute Plan, customers pay for features that they use and calls that they make on a monthly basis. This plan enables you to customize your account by building your own feature package: starting off with a basic set of popular business phone features at $49.95 per month, you can then add (and delete) additional features as needed. Calls cost 2.9 cents per minute (and 3.9 cents per minute for inbound calls to toll-free numbers). Extension to extension dialing and internal calling are all free. There is no setup fee, nor any monthly recurring charges, when adding users or phones on this plan. The Per User Plan is ideal for organizations that have heavy phone usage. The plan offers unlimited Standard Area calling for $18.95 per person per month (the Standard Calling Area covers the continental U.S. and 14 other countries). This plan enables customers to set up an unlimited amount of calling features like voicemail boxes, groups, and auto attendants; if features like conference suites and call queues are needed, they can be purchased a la carte. Call recording for each user is included in the Per User Plan. For a limited time, new OnSIP customers who sign up for a Per User Plan account for $18.95 will get unlimited Standard Area Calling plus a Polycom desk phone for every user. OnSIP was built using a completely different paradigm than competing business VoIP phone services. With some competitors, what customers are really buying is space on a single PBX deployed in a datacenter somewhere. This means sub-optimal call routing, scaling issues, and downtimes if anything should ever happen at that particular location. With OnSIP business VoIP, every single service offered is tied to a geographically distributed cloud of SIP proxies all built using open source projects. Customers get industry-leading reliability, geographic scaling, and increased flexibility. See our platform page for more information. Calls within your OnSIP business VoIP network are never charged, even if your employees are thousands of miles away from each other. Calls to other OnSIP customers and calls to external SIP addresses are also free. The easy-to-use OnSIP Admin Portal allows every administrative user to have complete control. Any changes or additions to customers' cloud-based phone system can be accomplished with just a few mouse clicks. Best of all, the changes made in the browser get instantaneously pushed so there's never any waiting. If you should ever run into a problem that you cannot solve on your own, we have an extremely knowledgeable U.S.-based customer support team at your service. Our extensive online knowledgebase is also jam-packed with information covering device setup, troubleshooting, and business VoIP best practices.